Nearly 140 examples of art and artifacts depict a rich symbiosis of ancient Tibetan art and science of medicine, leading up to a continued relevance in today’s world where modern practitioners dispense “precious pills” of medicinal compounds with the Ayurvedic stamp of approval, not the FDA’s. Here, a Buddhist neophyte can pause between the centuries-old thangkas to have her pulse taken at a station interactively with the aid of a video, albeit Tibetan-style. Nearby, a serious scholar pores over the earliest representation of the Medicine Buddha, an imposing yet fragile painting on silk, sealed in a desert cave in western China for a thousand years and on display in the United States for the first time ever. What unites us all, apparently, are Wind, Bile, and Phlegm, the three forces that compose the human body. Maintaining balance within these forces ensures physical and mental well-being. However, to engage in this non AMA-vetted, non-insured way of addressing health issues is purely a leap of faith, and comes directly out of pocket. Intrigued, I discover that my dominant force is Wind, and with that new knowledge I set out with Assistant Curator Elena Pakhoutova. Divided onto two floors, the exhibit explores origin and history, theory and practice. I am curious to learn if these 9th C. healing traditions feel transmutable to the here and now.. The Medicine Buddha (Bhaishajyaguru) greets us both in painting and sculpture depicting this earliest connection to Buddha (and the source of all Tibetan medical tradition) as holding a bowl of healing nectar in his left hand, and in the right, a myrobalan fruit. Chebulic myrobalan, beleric myrobalan, and Indian gooseberry make up a Dresum, or cure-all, which contains the fundamental ingredients for 8,000 recorded Tibetan medical formulas. Museum object labels that provide the traditional art and historical background for the works on display also include “What’s Your Force?” information and identification signage, with color codes (Wind = Blue, Bile = Yellow, Phlegm = White) that visitors can see if they identify with once their force has been determined. Interspersed throughout are specimen jars of healing herbs and ingredients, seemingly lifted from an apothecary in Chinatown, and also coded to the three forces. I wander into the Four Tantras area, which is accompanied by a soft chanting from above. These medicinal texts dating back to Buddha via Bhaishajyaguru were gathered and transcribed by Yuthog Yonten Gonpo, a 12th century high lama and Tibetan physician. Instructional tantra was often shared by chanting, as well as by visual metaphor. Beautifully detailed thangkas illustrate the Medicine Buddha surrounded by disciples, mountains, and a medicinal forest. Text was converted into woodblocks for sharing, teaching, and pharmaceutical trade. As the next incarnation of a vessel for transmission of knowledge, I absorb as much as I can of this complex documentation and move on. The Tree of Diagnosis, a 17th C. Tibetan painting on cloth and brocade, shows three trunks for each of the main diagnostic methods: visual observation, feeling the pulse, and questioning. Treatment was (and still is) determined after a complex assessment of the patient’s medical, personal, social, and climatic circumstances, and often includes dietary advice, medicinal compounds, and external therapies. Elena points out the complex detail of a chart depicting the fetal journey, adding the fascinating insight that all doctors were men and had nothing to do with delivering babies. Midwives most likely were the unsung heroines for not only the birthing, but also the accurate transmission of knowledge as to what exactly went on in there. How did they know? Preventative measures are taken far more seriously by Tibetan physicians than many of our counterparts joined at the hip to the FDA, but from western perspective might seem like quaint superstition–until one considers the Buddhist tenet that the self and the rest of the universe are not separate entities but one. Threaded crosses, amulets filled with blessed substances to appease the spirits and ward off demons, as well as attunement to the lunar calendar all have important roles to help one stay connected. At the other end of the spectrum are external treatments. As I peruse the cabinets of blood-letting instruments, the golden needle (inserted into the top of one’s skull as a sort of isolated, extreme acupuncture), and the cones used for moxibustion (which entails burning the herb moxa down into various points on the body), I wonder if these will soon be growing trends in western alternative treatment. 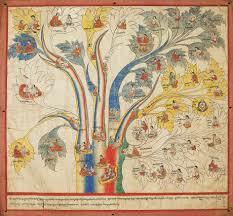 Imagine if the Affordable Care Act included the choice of Tibetan medicine! I guess Obama’s health care program has its hands full enough without trying to add anything like this. Near the exit, a multi-media installation that allows one to find information on a virtual map shows how Tibetan medicine continues to thrive and adapt to today’s world. Finding a practitioner might not be as easy as paging through Blue Cross’s provider directory, but more information is available here: http://www.dharma-haven.org/tibetan/medicine-clinics.htm. While I still had the ear of the assistant curator, I asked her about my primary concern, which is the poaching of soon-to-be-extinct animals such as elephants, rhinos, and bears for sacred ingredients in traditional Asian medicines. She assured me that in Tibetan medicine these rare ingredients can be substituted and so their impact is not as prominent as with other trades elsewhere, including China. I took her at her word, thanked her for her time and expertise, and wandered off to the cafe, where the menu features specialties attuned to one’s life force. The color codes appear next to a few tasty selections. The only offering for Wind was beef momos. I had to pass–I am vegetarian.